Most security tools leap into action only after they've detected a threat--and sometimes that's too late (especially if the threat is one that's new and unknown). The only way to really stay safe while you're online is to work inside a virtual environment--a kind of protected bubble (a.k.a. "sandbox") that operates on your PC but isn't directly tied to it. Trustware's BufferZone Pro creates exactly that kind of protected bubble, thus offering a unique (and theoretically impenetrable) level of protection. 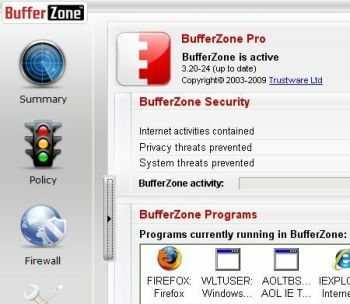 BufferZone Pro originally sold for $39.95, but Trustware has decided to offer the software free to home users. The software's virtual environment isolates security threats and prevents them from ever touching your PC. With it you can safely download, install, and run any application without worrying about Trojan horses, worms, keyloggers, spyware, Adware, phishing attempts, or other computer-clogging malware. This newly free Pro version includes support for USB devices (flash drives, etc. ), P2P file sharing, all instant-messaging programs, and personal files (which get stored in a confidential folder). And unlike many security tools, BufferZone Pro isn't subscription-based, meaning you won't get hit with a $40 bill a year from now. It's free, period. The software is available in 32-bit editions for Windows XP, Vista, and 7; a 64-bit version is in the works and due to be released by the end of this month. It's not the most novice-friendly tool I've ever used, but if you've had malware problems in the past or you're concerned about the effectiveness of your security software, I highly recommend taking this freebie for a test-drive.